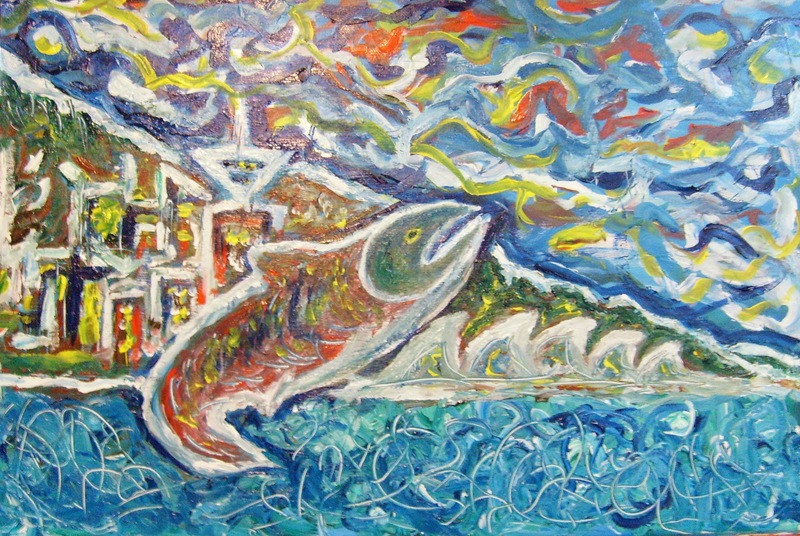 "In dedication to the lost streams of Vancouver and inspired by my personal involvement in Arts Based Advocacy for Wild Salmon." "Salmon are more than about Ecology, it is part of the cultural history and economic means of the West Coast of Canada." "Almost 30 million Salmon returned to spawn this year, which is the highest in a century. Although we celebrate this return, there are still many questions to be answered in light of the collapse of the 2009 return. Many species and natural habitats are under siege and the migratory routes for the Fraser River Sockeye still pose a risk due to sea lice. 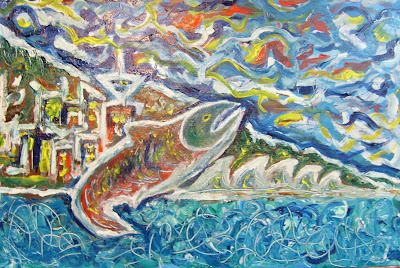 Salmon are more than about Ecology, it is part of the cultural history and economic means of the West Coast of Canada. Without Salmon, there would likely be not settlement on our rivers. Salmon celebrations were common place in this cultures. Many contemporary environmental issues can be connected through these magnificent fish. Whether it is Run of River power, Oil tankers on the North Coast, fish farms on natural migration routes, Gateway development destruction on local streams and tributaries. The salmon life cycle also contribute nutrition to our forests. Thus, Salmon are the gatekeepers to our sustenance and identity on the West Coast. To preserve the Salmon is to preserve ourselves." J Peachy is quickly becoming one of Canada’s foremost arts-based advocates for mental health. Having been exposed to the fast paced and a socially toxic corporate environments in High Technology, Telecommunications and Military contracting, drove Peachy into madness and into a dangerously serious illness of the mind. J Peachy saw his creativity and art as a critical means for survival in dealing with his challenges with Bi-Polar Disorder and the resulting social and economic collateral damage. Peachy is active in his art practice and Mental Health advocacy, through a number of different mediums. As the creator and producer of Sound Therapy Radio, an Arts and Mental Health Radio Show broadcasting on CJSF 90.1 FM and on Vcommunity TV (Shaw), he calls himself a ‘Radio-Visual’ Artist. J Peachy combines social media and the arts in a unique way to get the message across. Peachy lives for the free play, inspiration and healing that the natural environments can bring. 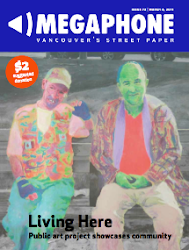 A lot of his work touches into themes of arts, independent spirituality and eco-psychology; as such, he calls Anmore, BC, Canada home and tries to keep grounded though the accessibility of nature that it easily within reach. J can often be seen with his dog Star and sidekick CJ the Sock Monkey. opportunity. Its kind of letting a child go. in the Downtown East Side for about 2 y...ears? Either way I am very happy"